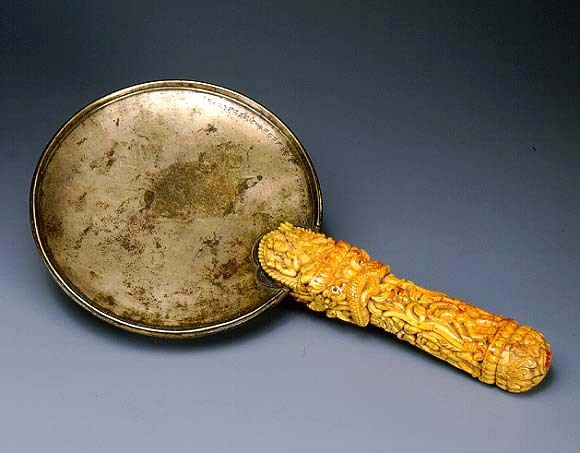 The bronze disc of the ladies' hand mirror has an ivory handle, a material rarely used in Nepalese art although it has always been readily available. Exquisitely carved, the handle depicts many themes of Hindu iconography. At the top of the handle, on the convex, reflecting side of the mirror, is carved the familiar theme of Vishnu Seated on Garuda. His wife Lakshmi and his vehicle Garuda accompany him. Garuda grasps a pair of the ever-present serpents, male and female (naga, nagini), whose entwined bodies encircle the handle in a characteristic representation, Krishna, playing his flute, stands cross-legged under leafy trees. It is a pose typical of ancient fertility goddesses called yakshis. He is flanked, on the sides of the handle, by a pair of dancing figures, perhaps his wives, Rukhmini and Satyabhama. At the top of the opposite side of the handle are Shiva and Parvati, each with their respective mount, bull and lion. Among the trees below them dances an apsaras, spouse of a celestial musician. On the concave side the mirror is inscribed in Newari: "Hail! In Nepal Samvat 853 (1733) on the day of the full moon of the bright half of the lunar month Bhadra (mid-August to mid- September), (a barber named) Sukura-bhana Napita offered this mirror to Lord of the Jewel (i.e. a Shivalinga named Ratneshvara)."